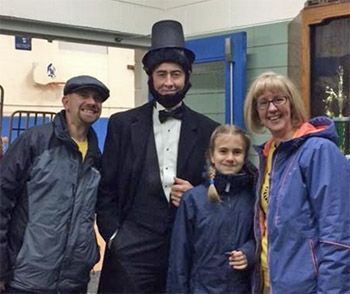 An Abraham Lincoln impersonator greeted parents and students as they entered to share in the evening. December 3, 2018 was the bicentennial of the State of Illinois’s admission to the Union. To honor the occasion, St. Mary Nativity School hosted a celebration where school families participated in a night filled with a variety of activities. However, an Illinois-themed celebration would be incomplete without an appearance from Honest Abe, himself. Partner Mike Stiff helped ring in the bicentennial by portraying Abraham Lincoln. Mr. Stiff was able to share his knowledge of Lincoln’s work and life with participants. The celebration began with students singing the Illinois State song followed by the Pledge of Allegiance. In preparation for the event, students in grades 2-5 created parade floats out of shoeboxes to represent different aspects of the State of Illinois, which were displayed during the celebration. Throughout the evening, families participated in square dancing (the state dance), Illinois Bingo, making charm necklaces, and feasting on the state snack (popcorn) and the state pie (pumpkin). To wrap up the celebration, everyone joined in to sing “Happy Birthday” to Illinois. Thanks for helping the community celebrate our great State’s 200th birthday, Mike Stiff!